Ralph Bakshi was never one for "making sense" in his animated features. He preferred stuff you could get expand your mind to: epic fantasy landscapes populated by bizarre creatures with motivations that are never completely clear. This is not meant to sound like criticism however. True, it had made a number of his films extremely difficult to understand, but it's also given him a distinct vision that sets him apart from other animation producers. For those of you unfamiliar with his efforts, check out features like "Fritz the Cat" and "Hey Good Lookin". And even his family friendly films have strayed away from the Walt Disney themes that are so part of our culture. 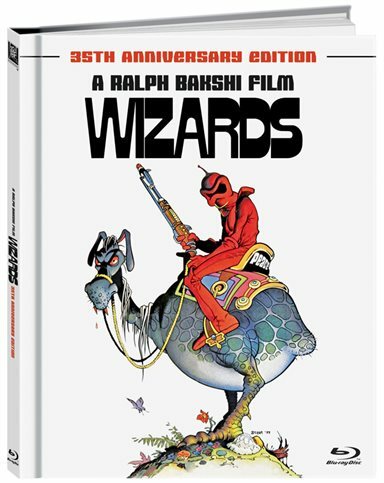 Wizards is a good representation of his vision: a fantasy adventure with heavy adult themes much similar to his later work. It also represented the first animated feature ever produced by 20th Century Fox, which returns the favor by releasing a new Blu-ray edition to celebrate the film's 35th anniversary. The film is still a cult favorite, and while it is hard to say everyone will like it, it's certainly unlike anything you've ever seen before. The story line-simple that it is- concerns an Earth of the far future, millions of years after a nuclear apocalypse. Magic has returned to the world, as have the elves and faeries that ushered humanity through its earliest eras. When the kindly wizard Avatar claims rulership over his mother's kingdom, his evil brother Blackwolf turns to technology in an effort to defeat him. Bakshi said that the drama is intended to reflect the creation of Israel, and it's hard to miss the point since his villain uses Nazi propaganda footage to inspire his troops. Beyond that, any efforts to make sense out of the spectacle depend solely on how much time you wish to spend analyzing the plot. Fans, however, would say all of that is beside the point. Wizards exists less as a story than as an exercise in imagination. Bakshi unloads the contents of his head with the torrent of a hurricane, traveling in every direction he can think of and probably a few he probably couldn't. Bakshi never apologized for his outlook and the hard-fast way which he pursued his projects brought a one-of-a-kind chapter to the halls of cinema. Wizards clearly succeeds solely because of its originality. In an era when corporate big budget film is the order of the day, the idea of an original concept is a breath of fresh air. You may not like Wizards but you won't easily forget it. There aren't a lot of movies which can legitimately make that claim. As was stated earlier 20th Century Fox released the film on a 35th Anniversary Blu-ray edition. Though it contains a gorgeous 24-page art book, the disc itself doesn't seem to have been cleaned up at all for the release. Extra features are a behind-the-scenes doc, TV and theatrical trailers, a gallery of stills, and running commentary from Bakshi. The enhanced clarity of Blu-ray also highlights many of the flaws in the animation itself. Fans of the original may not see the need to pick up this version as it lacks anything new. Although, as the original is out of print you may wish to go out and grab this one just to complete your DVD library. Download Wizards from the iTunes Store in Digial HD. For more information about Wizards visit the FlickDirect Movie Database.